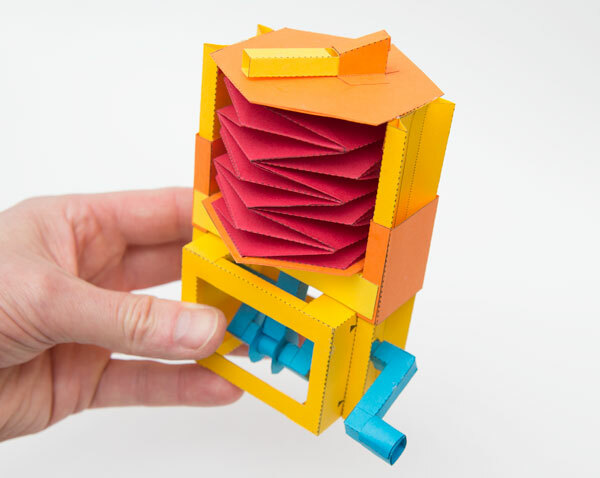 Here's another great mechanical paper design by Rob Ives called the "Twitterer Type 3". This one really sounds like a tweeting bird! In the previous blog post I showed a design for a crank driven bellows to be used at the heart of a bird box project. I have taken that basic design and made it more sturdy. I liked the way the bellows in the previous model were completely visible so I've fitted the crank to the inside of a box but kept the bellows on a pair of slide rails outside the box. You can see the result in animated action on Instagram by clicking the picture to the left. If you are a Member of Rob's site, you can download the parts to make this project. An annual membership to Rob's site, which provides access to LOT of amazing paper projects, is $14.95 per year. Here is where you can see the step-by-step instructions for the Twitterer Type 3.